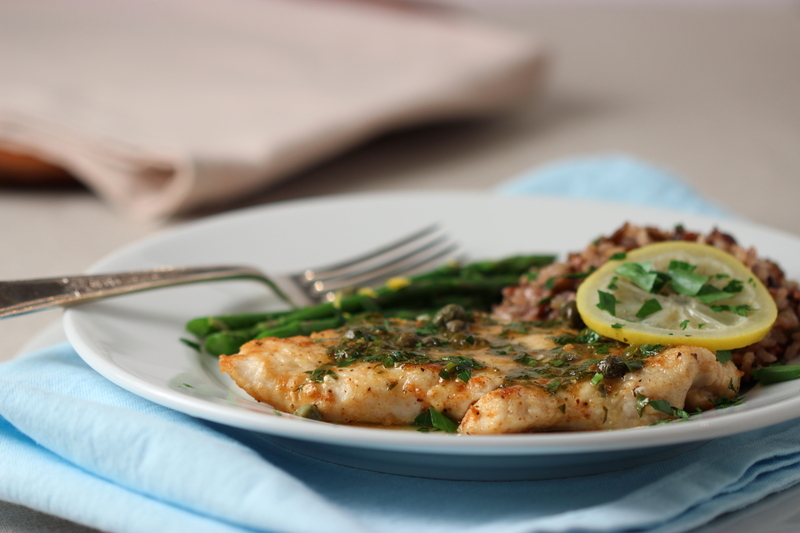 I’m not sure why this dish makes me think of spring…maybe it’s the bright flavors of the lemon and capers? Not sure, but it’s such a nice, simple dish. I made it last night in celebration of the new season. In a 9 X 9 inch baking dish, combine flour, salt and pepper. Heat oil and butter in a skillet over medium-high heat. Dredge the chicken in the flour mixture, and place in the skillet. Saute 2 minutes on each side, until golden brown. Remove from the skillet. Add the wine, lemon juice, capers and parsley to the skillet and bring to a boil, then remove from heat after about 1 minute, or until sauce thickens slightly. Season with a bit of additional salt and pepper. Spoon sauce over the chicken. I like to serve with either steamed white or wild rice, and a green vegetable, such as asparagus. This entry was posted in Chicken, Comfort Food, Main Dishes and tagged Capers, Comfort Food, Cooking, Food, Foodie, Recipes on March 25, 2013 by AnotherDish. I tasted this dish for the first time while on vacation in Bali — fell in love with it and determined that I would recreate it at home. It wasn’t too difficult to prepare — I think this dish is easy enough for anyone yearning for something different. I’ve made this dish several times since that trip. I like to serve it with telur kari (Indonesian curried eggs), steamed coconut rice and steamed green beans. Combine the pork, onions, red bell pepper, garlic, cumin, coriander, Laos powder, salt and sambal ulek in a medium bowl. Let stand half an hour. Meanwhile, combine the coconut milk and the salam leaves in a small bowl and set aside. Heat the oil in a wok or other pan over medium-high heat. Add the pork mixture and saute until the pork is no longer pink, about 4 minutes. Add the coconut milk and salam leaves to the pan. Bring to a boil, then simmer over low heat, uncovered, until the sauce is very thick, about 25 minutes. Stir in the tamarind juice, then serve. This entry was posted in Indonesian, Main Dishes, Pork and tagged Cooking, Food, Foodie, Indonesian Food, Recipes, Spicy on March 20, 2013 by AnotherDish. Delicious — I made these eggs last night to serve as an accompaniment to babi lelawar (Balinese pork in a coconut sauce) and coconut steamed rice. They are so easy to make, and they taste nothing like grandma’s deviled eggs. Try this recipe. 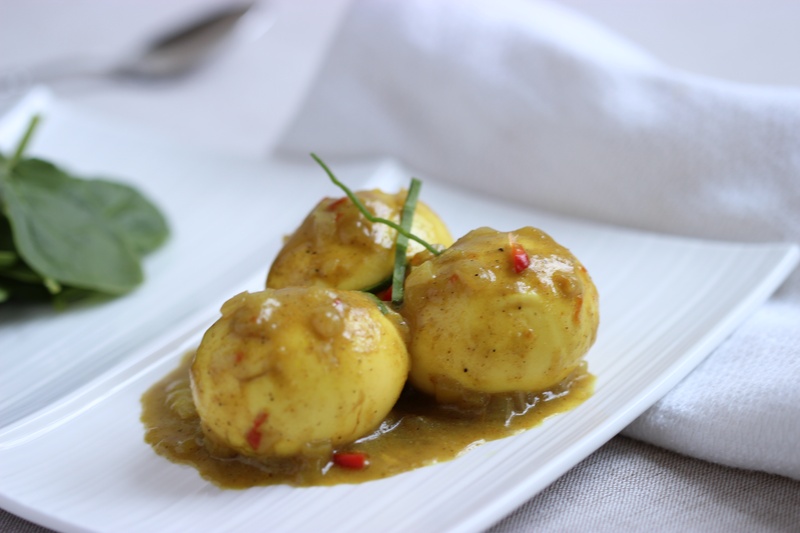 Combine onions, garlic, curry powder and lemongrass in a small bowl, and set aside. Heat oil in a wok or other pan. Add onion mixture and saute until onions are just translucent, about 3 minutes. Add sambal ulek, salam leaves, kaffir lime leaf, coconut milk, salt and kecap manis to the onion mixture. Bring to a boil, add eggs, then simmer, uncovered, over low heat until the sauce has darkened and thickened, about 25 minutes. 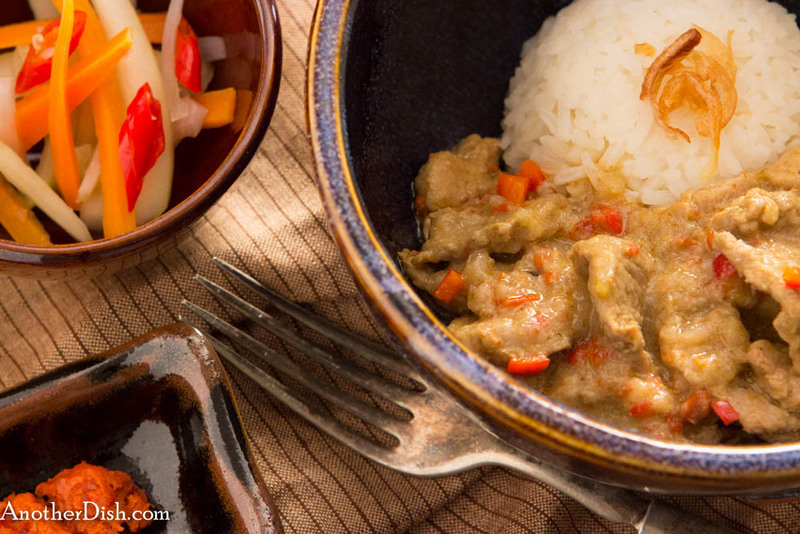 Serve as an accompaniment to an Indonesian meal. This entry was posted in Indonesian and tagged Cooking, Eggs, Food, Foodie, Indonesian Food, Kecap Manis, Recipes, Spicy on March 19, 2013 by AnotherDish. 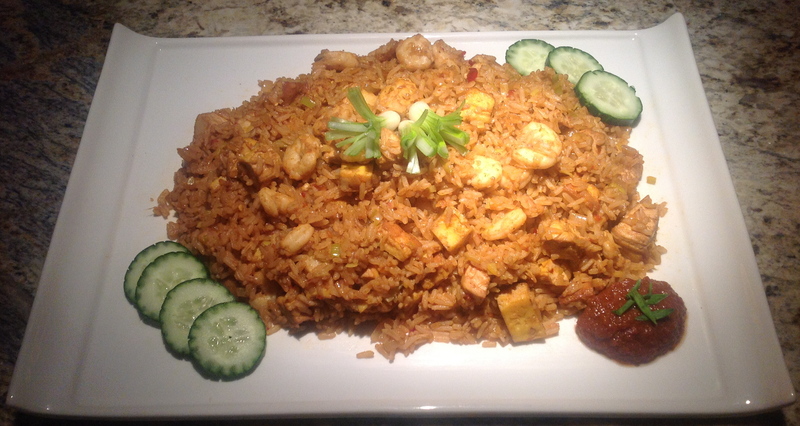 Nasi goreng literally translates to “fried rice.” It’s another common dish in Indonesia, and believe it or not, they like it so much, they eat it for breakfast there! This dish is easy to make, but plan ahead, as you must use leftover rice (or cooked rice that’s been refrigerated for 4 hours). Trim the chicken breast, and poach in turmeric water. To do this, combine the water, salt and turmeric in a small pan. Bring to a boil. Add the chicken breast (water should come up to half way on the chicken; must not be fully submerged). Cover and reduce heat to low. Simmer gently for 8 minutes. Flip breast over, then simmer, covered, for an additional 8 minutes. Remove from heat and dice (rather finely). Set aside. Heat a small frying pan that has been coated with cooking spray on low heat. Cover and cook until the eggs are set (like an omelette, but don’t flip or turn). 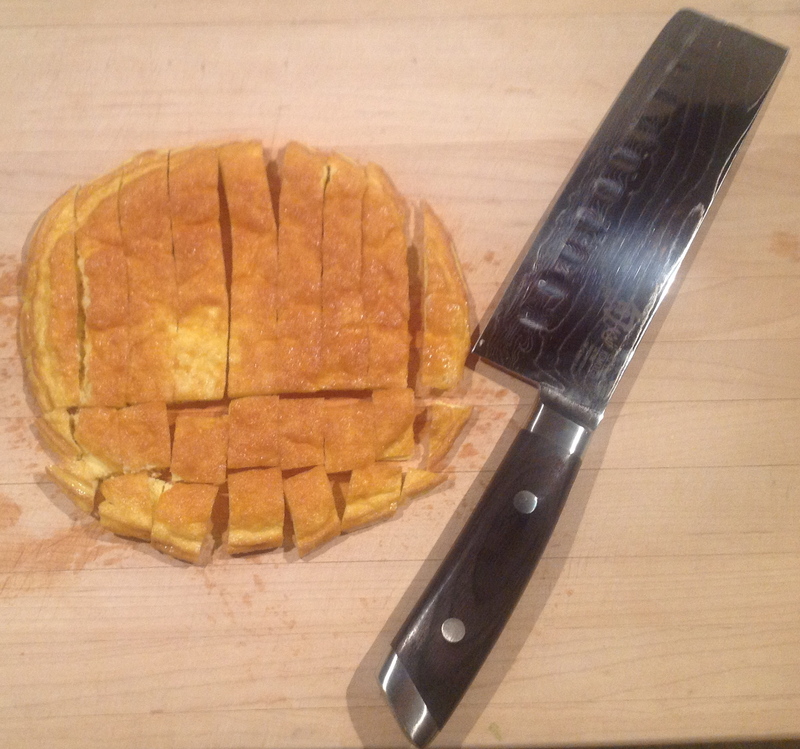 Remove from pan and cut into small cubes. Heat oil in a large wok or frying pan over medium-high heat. Add the onions, garlic, leek and sambal ulek. Stir fry until the onions are soft, about 2 minutes. Add the coriander, cumin and Laos powder, and stir for another minute. Season with a bit of salt. Add the chicken and shrimp, and fry until the shrimp are no longer pink, about 2 minutes. Add the rice, egg cubes and kecap manis. Turn the heat up to high, and stir fry for another 5 minutes, until all ingredients are well mixed. Serve hot. This entry was posted in Chicken, Indonesian, Pastas and Grains, Shrimp and tagged Cooking, Food, Foodie, Indonesian Food, Kecap Manis, Recipes, Rice on March 3, 2013 by AnotherDish. 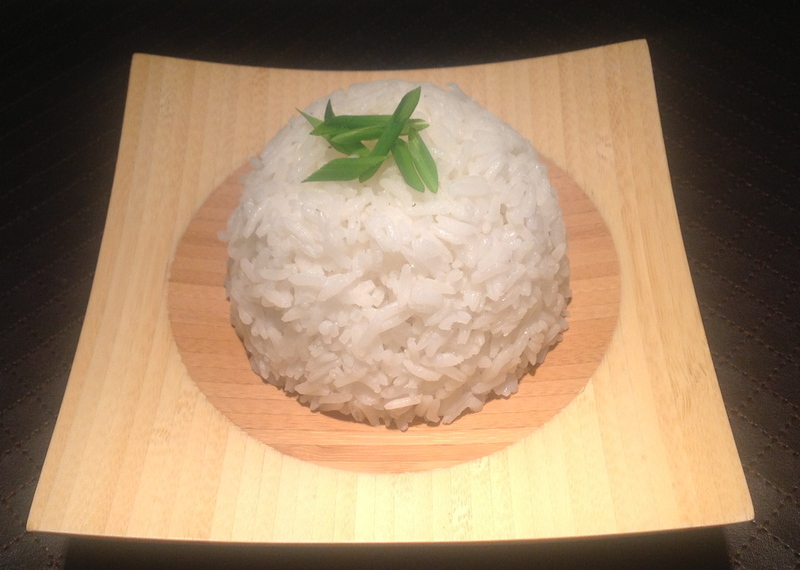 This recipe for steamed jasmine rice is so easy, and it turns out perfectly every time. This is my standard go-to recipe for just about any Southeast Asian dish that is served with rice. Although you are supposed to rinse the rice in cold water until the water is no longer cloudy, I don’t bother. In fact, I think it upsets the moisture content for this particular recipe, causing the finished product to turn out mushy. For coconut rice, simply add 2 tablespoons shredded, unsweetened coconut before you put the lid on to steam. Combine rice, water salt and butter (and 2 Tbsp of shredded coconut if you desire) in a sauce pan. Bring to a boil. Stir well. Put the lid on and reduce the heat to very low. Simmer for 20 minutes. Remove from heat and fluff with a fork. Put the lid back on and let stand for 10 minutes before serving. This entry was posted in Pastas and Grains and tagged Cooking, Food, Foodie, Jasmine Rice, Recipes, Rice on March 3, 2013 by AnotherDish.